Published on 19 June 2012. Designed and built entirely on Teesside, and opened in 1934 by the Duke and Duchess of York (later the Queen Mother), this is the Tees Newport Bridge. It has a span of 82m, and two 55m lifting towers with counterweights of nearly 7,000 metric tonnes. The little hut perched on the middle of the bridge is the winch-house, from where the up-and-down movement of the bridge was controlled. I say “little hut”, but I understand that it’s actually a quite beautiful oak-pannelled control room, modelled on the bridge of a ship. The bridge was winched by electric motors, though did have petrol backups. The third-line backup was to winch by hand, but it’s said that this would have taken twelve men eight hours. 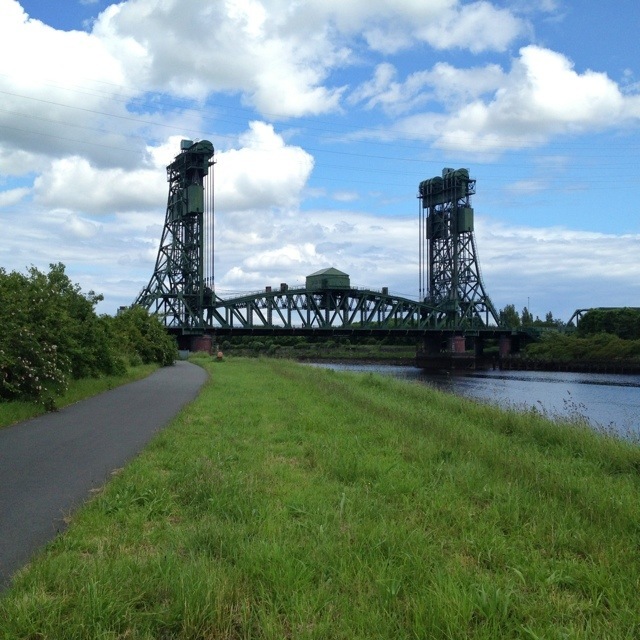 22 years ago, after a final ceremonial raising and lowering (which is actually on YouTube), the road bridge was bolted in place: there was really very little point in continuing to maintain the lifting mechanism given that the innavigable (at least to big ships) Tees Barrage was just about to be constructed a little upstream. There was initially some speculation that the massive steel counterweights could therefore be detached and sold as scrap, until some bright spark realised that they were still actually supporting the weight of the road bridge, even though movement was prevented by the bolting process. The bridge remains busy with traffic, as it’s part of the A1032. This 1,693rd post was filed under: Photo-a-day 2012, Architecture, Bridges, Middlesbrough.